In a recent study conducted by NYU Langone Medical Center, researchers found that posting the calorie content of menu items at major fast-food chains does not sway customers to change their purchasing habits or switch to lower calorie items. The Patient Protection and Affordable Care Act mandates large restaurant chains (20 or more nationally) to give public access to their customers the nutritional content of all the food and drink items on their menu. The labels include calorie and fat content. In wake of the new legislation, Dr. Elbel, assistant professor of Population Health and Health Policy at NYU School of Medicine, set out to evaluate the impact of calorie labels at fast-food chains. Do they impact our society to make healthier choices? Currently, there are limited scientific real-world studies that support calorie labeling. Dr. Brian Elbel explains that many consumers either don't notice the calorie labels or they simply don't use the calorie charts to base their decisions on what to eat. Only 10 percent of the respondents declared that calorie labels at fast-food chains prompted them to choose another item with fewer calories. Researchers collected receipts from more than 2,000 customers, ages 18-64, who visited McDonald’s and Burger King restaurants during lunch or dinner. They collected receipts from customers before February 2010, when the calorie-label law went into effect in Philadelphia, and then collected again after February 2010. A professional survey firm was then hired to conduct a random phone survey of Philadelphia residents. Survey participants were asked a series of questions that included whether or not they had eaten at a “big chain” fast food restaurant within the last three months. Depending on their responses, they were further prompted to answer questions on their demographic, their body composition, and also how often they ate at fast food chains. Only 34% of McDonald’s customers noticed the calorie labels posted as compared to 49% of Burger King customers. Researchers found that customers with less education were even less likely to notice the labels. Even after the calorie labels went into effect, the results showed that respondents who ate fast food more than 5 times a week, continued to eat the same amount regardless of the postings. They did not change their habits. 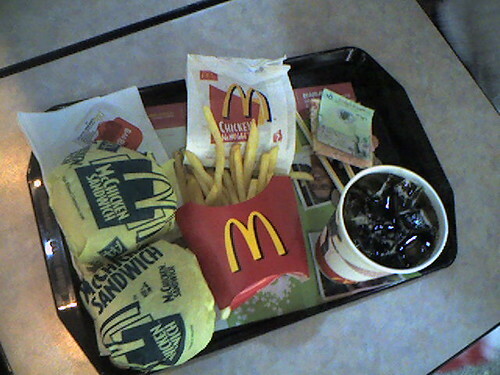 The calorie label law did not decrease visits to fast food restaurants. Dr. Elbel’s study echoes the same results as the Carnegie Mellon University study that was published in the American Journal of Public Health. Julie Downs, associate research professor of social and decision sciences in CMU’s Dietrich College of Humanities and Social Sciences, and the research team assessed the influence of calorie information and the purchase behaviors of 1,121 adult lunchtime diners at McDonald’s restaurants. Three groups were given three types of calorie information in addition to the pre-existing menu labeling. One group was given their recommended daily calorie intake. The second group was given the recommended per-meal calorie intake and the third group was not given any additional information. Did the additional information give the consumer more reason to switch to a lower calorie item? The answer was no. There were high expectations that menu labeling could be an integrative tool to combat the epidemic obesity rates in this country. While people appreciate the information, it does not lead to reduced-calorie consumption. If a person is stepping foot inside a fast food restaurant, they are not looking at labels to guide their eating habits. Researchers conclude that calorie posting is not enough to induce a behavior change among all populations. Instead, let's encourage people to switch habits over time and emphasize limiting and reducing meal times at fast food restaurants. People can stick to a routine if the choices are gradual and over time. We can all make a continuous effort to eat less and move more. Submitted by Diana (not verified) on Thu, 12/12/2013 - 07:31. Great Post :) I think also the same: Calorie Information on Menus Does Not Improve Consumer Choices. Thank you fo sharing this.